I first learned about the phenomenon from two colleagues while we were meeting in my office a couple of weeks back. 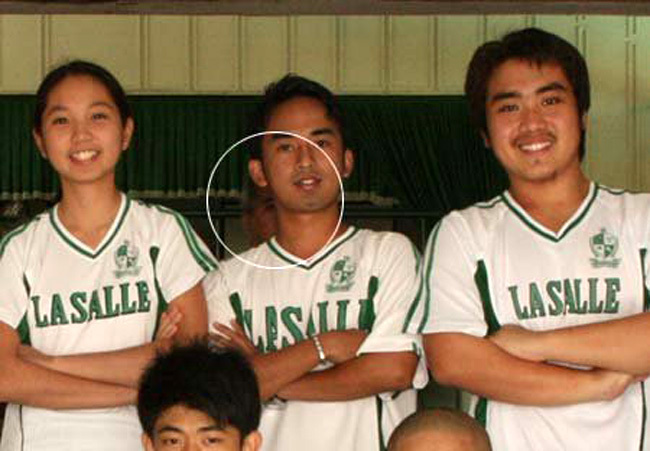 Art, the photographer at the Marketing Department, had apparently been taking pictures of the varsity teams of De La Salle Lipa for posterity. One particular picture, when downloaded to a PC, had everyone’s eyebrows shooting upwards. The picture was of the table tennis team, taken at the Hall of Lasallian Saints in front of the J.P. Laurel National Highway. In the picture, there was a man behind one of the players who Art swears wasn’t there when the picture was taken. You decide. The picture looks eerie when downsized for web purposes. Not so eerie when zoomed to full size. I have seen the picture both on Art’s digital camera and in a PC at the Athletics Office. Yes, the picture has made the rounds of the school. I still don’t quite know what to make of it. In the downsized picture I am posting, it will definitely look like someone from the other side wanted to be captured as well for posterity. And the Hall of Lasallian Saints, well, everyone who has been associated with the school knows that stories abound of things that go bump in the night, if not in the hall itself, then in the adjoining gymnasium. When I was a high school student back in the seventies, there were stories of the sound of footsteps coming from the gym, as though there was a squadron of soldiers marching on it. Word was that the entire school sat on what used to be a Japanese military camp during the last World War. I myself would like to think there is a technical explanation to the picture that Art took. I mean, and I am by no means an expert in the paranormal, but what I know is that those in the afterlife supposedly use some form of static electricity to manifest themselves in the material world. Hence, on the extremely rare occasions they are captured on film, they appear ethereal. Zoomed to its full size, the picture shows the edge of the man’s head – the one behind the player – in a somewhat translucent state. This is consistent with what I would expect, if indeed, the captured image belongs to the realm of the paranormal. That said, I am making no conclusions. The last thing I need would be for the entity – if, indeed, it was one – to accost me at the Hall of Lasallian Saints on my way out one evening just to prove his existence. But I did tell Art this story which happened a couple of weeks after my Mom was laid to rest. The still of the night was broken by what sounded like someone knocking on my door. But if it was Mom, she was starting to get on my nerves as the knocking became more persistent. Because I couldn’t sleep, I finally steeled myself to get up, turn on the lights and open the door. Therefore, I said to Art, there was no point in scaring himself unnecessarily over something that, in most probability, had a perfectly logical explanation.